To develop and validate a radiomics nomogram to preoperative prediction of isocitrate dehydrogenase (IDH) genotype for astrocytomas, which might contribute to the pretreatment decision-making and prognosis evaluating. One hundred five astrocytomas (Grades II–IV) with contrast-enhanced T1-weighted imaging (CE-T1WI), T2 fluid-attenuated inversion recovery (T2FLAIR), and apparent diffusion coefficient (ADC) map were enrolled in this study (training cohort: n = 74; validation cohort: n = 31). IDH1/2 genotypes were determined using Sanger sequencing. A total of 3882 radiomics features were extracted. Support vector machine algorithm was used to build the radiomics signature on the training cohort. 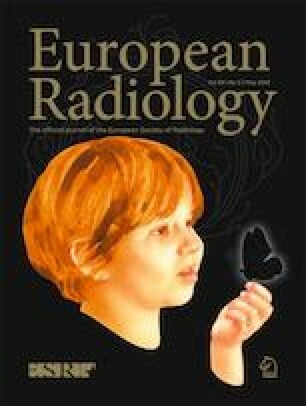 Incorporating radiomics signature and clinico-radiological risk factors, the radiomics nomogram was developed. Receiver operating characteristic (ROC) curve and area under the curve (AUC) were used to assess these models. Kaplan–Meier survival analysis and log rank test were performed to assess the prognostic value of the radiomics nomogram. The radiomics signature was built by six selected radiomics features and yielded AUC values of 0.901 and 0.888 in the training and validation cohorts. The radiomics nomogram based on the radiomics signature and age performed better than the clinico-radiological model (training cohort, AUC = 0.913 and 0.817; validation cohort, AUC = 0.900 and 0.804). Additionally, the survival analysis showed that prognostic values of the radiomics nomogram and IDH genotype were similar (log rank test, p < 0.001; C-index = 0.762 and 0.687; z-score test, p = 0.062). The radiomics nomogram might be a useful supporting tool for the preoperative prediction of IDH genotype for astrocytoma, which could aid pretreatment decision-making. • The radiomics signature based on multiparametric and multiregional MRI images could predict IDH genotype of Grades II–IV astrocytomas. • The radiomics nomogram performed better than the clinico-radiological model, and it might be an easy-to-use supporting tool for IDH genotype prediction. • The prognostic value of the radiomics nomogram was similar with that of the IDH genotype, which might contribute to prognosis evaluating. Yan Tan and Shuai-tong Zhang contributed equally to this work. The online version of this article ( https://doi.org/10.1007/s00330-019-06056-4) contains supplementary material, which is available to authorized users. This study has received funding by the National Natural Science Foundation (81471652 and 81771824 to Hui Zhang; 81227901, 81527805, 61231004, and 81671851 to Jie Tian; 81701681 to Yan Tan; 81771924, 81501616 to Di Dong; 11705112 to Guo-qiang Yang); National Key R&D Program of China (2017YFA0205200 and 2017YFC1309100 to Jie Tian, 2017YFC1308700 to Di Dong); the Precision Medicine Key Innovation Team Project (YT1601 to Hui Zhang); the Social Development Projects of Key R&D Program in Shanxi Province (201703D321016 to Hui Zhang); and the Natural Science Foundation of Shanxi Province (201601D021162 to Yan Tan). The scientific guarantor of this publication is Hui Zhang. Written informed consent was not required for this study because this is a retrospective study and patient data are anonymized.